It would be nice to get a new camra before my new grandbaby is born. Thanks for the chance. I’m already subscribed - count me in for the drawing please. Thanks! I’m a new email subscriber & I would like to be entered to win this camera. Thank You. What a great prize. Thanks for the contest! subscribed already and ready to win! I’ve subscribed! Please enter me to win! I don’t know what I’d do with a real camera! I’m already a subscriber and I would like to enter. I am already a subscriber! Would love to win this for my better half! We love to photograph wildlife and our old camera just doesn’t cut it! Thanks! I would LOVE to enter. I’m already a subscriber. Thanks!! Exactly what I asked Santa to bring me ‘this Christmas! Nikon makes the best cameras and I would love to own this one. I’m already subscribed. Great prize, I would love to try out a Nikon DSLR. I’m a subscriber. Thanks for the chance to win such a sweet camera—it’s a shutterbug’s wish list item for sure, and would make a much nicer gift for my photo-obsessed sister than anything I can afford to give her on a student’s budget. Thanks a lot! We live in Alaska and have 1 nephew and 3 neices in Miss. We need this neat camera! Thank you. I subscribed, I think. When I clicked “Go” it just took me to a page with a logo so there was no confirmation. Thank you for the chance to win this terrific camera. This would be incredible! I subscribe. i subscribe already! great giveaway! I’m already a subscriber and I’d like to enter. Thanks. I’m already a subscriber and would LOVE to win this camera. I am a current email subscriber. Both my husband and I studied photography at RIT. We both are passionate about photography and love to work on our own personal documentary projects. But, ever since we started having a family, and we are at 3 young children right now, we have not been able to spend the $$$ on updating our photography equipment. We used to feel like we were using the best equipment out there in order to capture the most compelling images, but now we feel very much “out of the loop” when it comes to even being close to having adequate equipment. Some of our cameras won’t even hold a charge anymore because the batteries have gone on us. 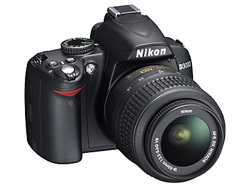 We would love nothing more than to own this amazing Nikon D3000 digital SLR DREAM CAMERA! It would really motivate us to start capturing those candid moments of our children and resume our documentary work! Thanks so much for the chance to enter and Happy Holidays to ALL!! I already subscribe, and I would love to enter! Thanks! Enter me in the contest please & Merry Christmas and Happy Holidays to all ! Wow! Awesome camera!! My is starting to freeze up so I really really could use a new camera. Fingers crossed! Became a new subscriber a few days ago. Would love a new camera! I’d love to win this one! I’m a subscriber. Thanks! This would be the most fantastic Christmas gift for my hubby! How exciting!!! I became a new subscriber a few days ago and have been visualizing winning and using the Nikon D3000 ever since!! I cannot wait to enter the photos I take with the Nikon D3000 into photo contests! ...and THANK YOU VERIZON for the opportunity…and sponsoring the giveaway! Happy Holidays to all! A great christmas gift for me. I need a camera, and this is a quality one. I’m a subscriber…please enter me in the giveaway.